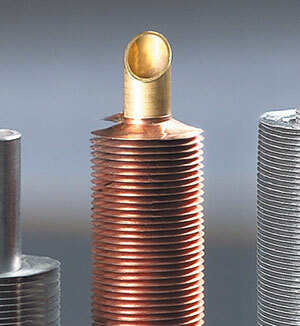 Pantani Divisione Tubi can provide several type of Finned Tubes with a wide range of applications including Air Coolers for Refineries plants, Refrigeration plants and Industrial heating plants. Applied Fin Tube is made with strip wrapped under tension around the base of the tube. Fins are welded to the base tube at the strip ends. For this type of finned tubes, depending on material, fins/meter, and strip material, our productive capacity is over 1000 meters per day. Embedded Fin tube “G Type” is made with the fin strip wounded into a machined groove and securely locked into place by back filling with base tube material. 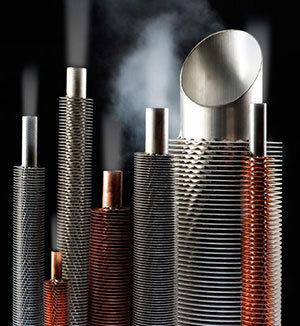 This technique ensures maximum heat transfer and a temperature of working until 450C°. For this type of finned tubes our productive capacity is over 2000 meters per day. Aluminium From 6 to 11 Fins / Inch From 0,4mm. to 0,5mm. The tube “L FIN Type” is made with the fin strip wounded under tension on the tubes and secured for the optimum contact pressure on the foot of the fin onto the base tube with an “L” or a “double L” bend of the fin. 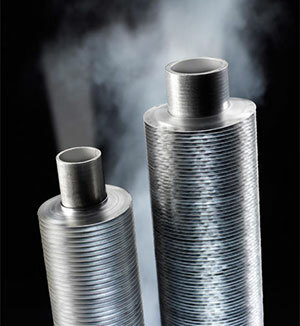 This technique ensures maximum heat transfer properties and temperature of working until 150° C. For this type of finned tubes our productive capacity is over 3000 meters per day.